In Ray Bradbury's Fahrenheit 451 people have committed to memory entire contents of books like a living library. 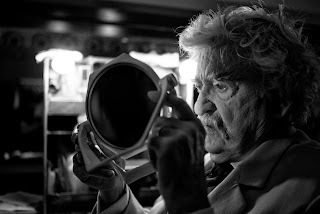 Actor Hal Holbrook has practically done the same thing for the past 61 years by giving his dramatic recitations from Mark Twain's writings in a one act play. Director Scott Teems and producer Laura D. Smith have put together an excellent homage to Mr. Holbrook's career. Filmed in black and white, it includes interviews with Sean Penn, Martin Sheen, Emile Hirsch and others. The filmmakers were encouraged by Holbrook's late wife Dixie Carter who inspired Holbrook to continue with his work as Twain. Holbrook and his first wife Ruby graduated from Dennison University after WWII and had constructed a two person show featuring characters from Shakespeare to Twain playing to the school assembly circuit. In 1954, Holbrook did his first solo performance as Twain. While doing a soap opera during the day in New York, he continued to work on his Twain character at a Greenwich Village night club, until one day Ed Sullivan saw him and gave him a spot on his show. In 1959, he opened in an off-Broadway theater to become an “overnight” success with rave critical reviews. Since then he has taken his solo show all over the country and Europe. He's won a Tony, a Drama Critic's Circle Award and a Emmy. Although he's been in numerous movies, television shows and plays, he continued to be Mark Twain in his travelling one man show. He keeps detailed notebooks of each performance so he knows what material he did in each city so there isn't duplication. Plus he records the response of the audience as well as changing the material to fit the times and places. He even created a special makeup suitcase with everything he needs to change his face to that of Twain. The makeup, the dressing, the running of his material each night is a ritual that keeps him centered. The film is filled with vintage photos of Holbrook's varied career. Actors speak of how they were inspired by him, his children remind us that being the child of an actor is not a easy life and Twain scholars have been influenced by his work. His ability to remember the long and intense Twain speeches and craft them to particular audiences over the years is mind boggling considering his humbleness as a human being. It is truly remarkable that at 90 years old, Holbrook continues to bring his show to audiences. When he is gone, it will be like losing Mark Twain all over again.